Dr. Mendez was a standout practitioner, teacher and researcher, said UW's chair of otolaryngology-head and neck surgery. Dr. Eduardo Mendez will be remembered for his energy, kindness and humor, said his department chair. Dr. Eduardo Mendez, a UW Medicine surgical oncologist and Fred Hutch researcher known for extraordinary talent and compassion with patients, died Jan. 5 with family at his side. He was 45 and had battled cancer himself for two years. Services were held Jan. 10. Dr. Mendez was a professor of otolaryngology-head and neck surgery at the University of Washington School of Medicine. He directed the Head and Neck Translational Research Program at the Fred Hutchinson Cancer Research Center. 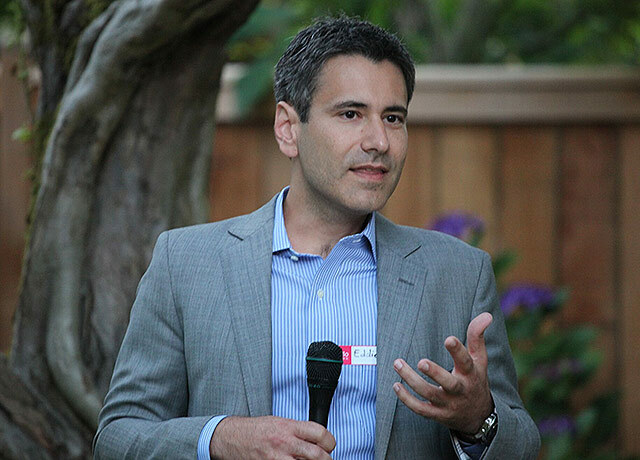 In 2010, Dr. Mendez led the first team in Washington state to perform a trans-oral robotic-assisted surgery, which has become an important option for patients with tongue and throat cancer. “Eddie improved the lives of countless patients with head and neck cancer, working to cure their disease and preserve their ability to speak and swallow,” Futran said. He called Dr. Mendez an “exemplary teacher in daily one-on-one interactions as well as didactic sessions locally and nationally.” In 2013 Dr. Mendez received his department’s Trachy Award for outstanding education. Dr. Mendez led a research laboratory funded by the National Institutes of Health. His early studies to examine the genetic expression of oral cavity squamous cell carcinoma blossomed into multiple efforts to identify novel treatment pathways for patients with head and neck cancer. Dr. Mendez received his M.D. with honors from the University of Maryland in 1999 after his undergraduate years at Princeton. He completed his otolaryngology-head and neck surgery residency training at UW in 2005, followed by fellowship in Advanced Head and Neck Surgical Oncology and Microvascular Reconstruction. Dr. Mendez completed a master’s in epidemiology at the UW School of Public Health in 2010. He became a UW assistant professor in 2006 and had recently been promoted to professor. He co-directed the UW School of Medicine’s Head and Neck Oncology Program and directed the training of fellows in that program. At Fred Hutch, he directed the Head and Neck Translational Research Program and, in 2016, became an associate member of the Clinical Research Division. Dr. Mendez is survived by his wife and two daughters. The Eduardo Méndez Endowment has been established for the UW Department of Otolaryngology. People who wish to make contributions in his memory can call UW Medicine Advancement at 206.543.5686.